Issaquah has been one of Washington’s fastest growing cities for several years in a row and has a population over 30,000 people. It is located in King County at the southern end of Lake Sammamish just east of the Seattle-Bellevue metro area. It's best known for its salmon hatchery (one of the most visited hatcheries in Washington) and its devotion to the outdoors, especially hiking the “Issaquah Alps”, a playful term for the area’s several mountains. As the city is constantly growing, housing here is quite new. 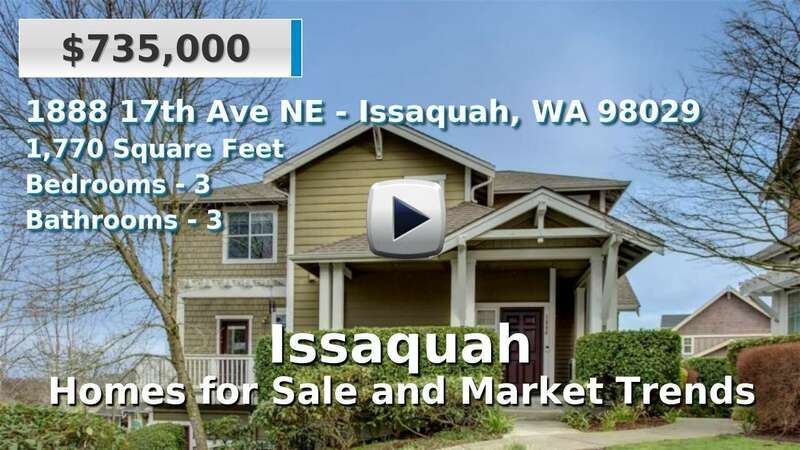 On average, homes and condominiums for sale in Issaquah were built between the late 1990s and present day, and provide a quick commute to Seattle, Bellevue, and Redmond, with an average drive time of 27 minutes. 3 Beds | 2.5 Baths | 3410 sq. Ft.
2 Beds | 2 Baths | 2020 sq. Ft.
4 Beds | 2.5 Baths | 2710 sq. Ft.
4 Beds | 2.25 Baths | 2877 sq. Ft.
4 Beds | 3.25 Baths | 4390 sq. Ft.
3 Beds | 2.5 Baths | 3100 sq. Ft.